Spokane 12, Tri-City 6: Diosbel Arias went 2 for 4 with a homer and five RBIs and the Indians (1-0) handled the visiting Dust Devils (0-1). Five players had multi-hit games for the Indians, including Francisco Ventura, who went 3 for 5. Jax Biggers and Curtis Terry drove in a pair of runs apiece. Cole Uvila (1-0) struck out five over 2.1 innings. Starter Tai Tiedemann allowed five runs on five hits and two walks with five strikeouts and three passed balls. 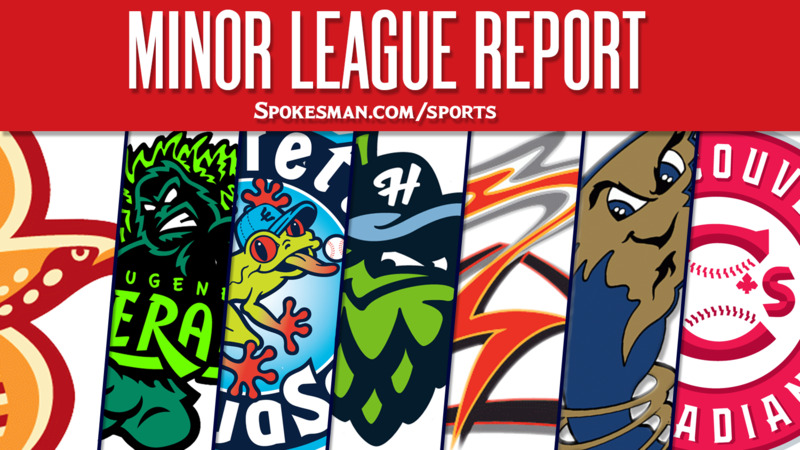 Salem-Keizer 4, Eugene 3 (10): David Villar hit a two-run ground-rule double in the 10th inning and the visiting Volcanoes (1-0) edged the Emeralds (0-1). Kyle McPherson hit a solo home run in the sixth inning and Norwith Gudino tossed five shutout innings for S-K.
Vancouver 4, Everett 3: Griffin Conine hit a solo home run – his fifth – and the visiting Canadians (1-0) edged the AquaSox (0-1). McGregory Contreras went 2 for 4 with two doubles and an RBI and Joey Pulido (1-0) provided two shutout innings in relief. Bobby Honeyman homered for Everett. Boise 5, Hillsboro 3: LJ Hatch went 2 for 3 with two RBIs and two runs and the visiting Hawks (1-0) beat the Hops (0-1). Nick Bush (1-2) struck out three over five innings for Boise. Jose Caballero went 2 for 4 with a two-run homer for Hillsboro. Round Rock (AAA) 7, Tacoma 2: Drew Robinson went 2 for 4 with a solo home run and two runs and the Express (49-53) beat the visiting Rainiers (51-51). Michael Roth (6-5) allowed two runs on seven hits and three walks over six innings for Round Rock. Midland 7, Frisco (AA) 3: J.P. Sportman hit a three-run home run in the ninth inning and the RockHounds (43-58) handled the RoughRiders (43-59). Tyler Ramirez went 2 for 4 with a homer and three RBIs for Midland. Brett Martin (2-7) tossed three innings for Frisco and allowed three runs on five hits and a walk with five strikeouts. Down East (High-A) 5, Lynchburg 4: Josh Altman scored the go-ahead run in the eighth inning and the Wood Ducks (46-57) edged the Hillcats (46-53). Altman hit his 18th homer in the sixth, a two-run shot, and Leodys Taveras went 2 for 5 with a solo homer, his fourth. Hickory (Low-A) at Greenville (ppd. ): Postponed due to wet grounds. Published: July 25, 2018, 5:55 a.m.